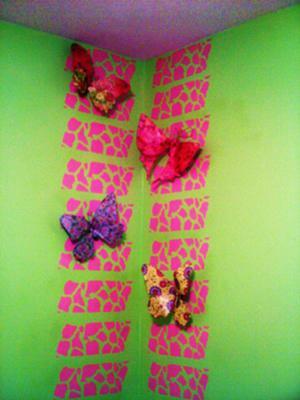 Handmade bandana patterned butterflies decorating my baby girl's nursery walls. Simple hot pink daisies add so much to the room! Here are some pictures of my Gypsy baby girl's pink and green nursery! The design for Eden's wonderland is for an all around Glitter Gypsy girl and my inspiration for decorating our baby girl's nursery in this style came from my love for animal prints and the color pink! The baby bedding that I chose is a girly, safari themed collection. The colors of the crib set are green, pink, yellow and orange. The fabric has some giraffe print as well as zebra print. The 4-in 1 crib, as you can see is painted a beautiful hot pink color that looks amazing against the bright lime green paint color of the nursery walls. The rest of the furniture, including a tall dresser and an armoire that has a built-in changing table, has a natural wood finish. 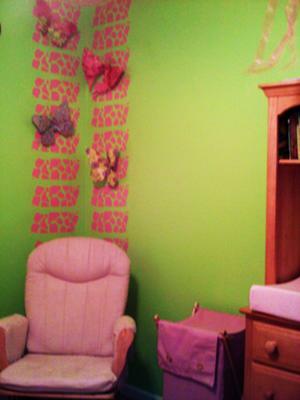 We painted all of the nursery walls a light, lime green color. After that was dry, we painted one corner of the room with a giraffe print design in a bright pink color to add interest and contrast to the solid green walls. The pink and green nursery walls give the room such a fresh and airy look! Layering the bandana patterned butterflies made the giraffe print stand out even more. This area of the room is the first thing that our visitors notice; it really draws the eye! 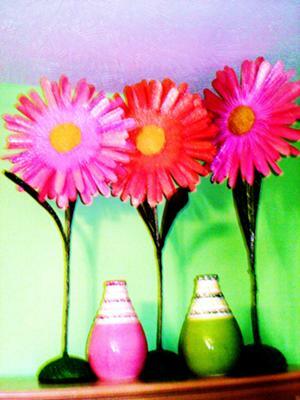 To make the room really POP, I got three simple, but colorful flowers to add to the decor. They are simple but BOLD! The last decoration that we put in place, which is my favorite, is the arrangement of glitter letters that are displayed above Eden's crib that spell her name. These glittering wooden letters for the nursery wall provided the ultimate girly touch to this adorable room perfect for our little gypsy girl. From the Webmaster: Thanks, Chelsey, for sharing your lovely pink and green nursery design with Unique Baby Gear Ideas' visitors! 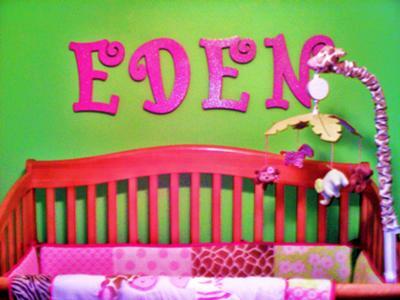 I love Eden's hot pink and green nursery. You chose the best color combination ever! Where did I get my decorations?? Thank You for all the comments!! I got most of the decorations from Hobby Lobby. The letters came hot pink and glitter. The flowers, however came plain. I just added a simple spray glitter to give it the perfect touch. The letters, butterflies,giraffe print all came from Hobby Lobby. Which is my FAVORITE store. I am a nursery designer and just wanted to say that i absolutely love your color scheme and accessory choices. This is an amazing nursery and a luck baby girl! Did you paint and glitter Eden's wooden letters yourself or did you buy them? I like the font. Where did you find them? Is your daughter really a gypsy or is that what you're calling the nursery's decor? Where'd you find the giraffe print stencil pattern? Did you make the butterflies yourself? If so, could you please tell me where you got the instructions? Great room BTW! Love the bright colors!